Regulations for skilled nursing are changing again in 2019. This implementation is the last of a 3-phase execution of new regulations which began in November 2017. This year, November 2019, will introduce survey review and compliance training requirements for various focused subjects. Let’s take a look at the overview of what will be required and surveyed beginning in November 2019 under F-TAG 940 – General Training Requirements. This regulation spells out, for the first time, what is required to be present in a training plan for employees—specifically related to each role in the facility. Keep in mind, the general requirements also cover the facility plan on educating contractors, agency staff and volunteers. Details of how training will be implemented are required to appear in the facility assessment which began being surveyed in November 2018. Identify goals of the quality assurance program for each specific area. Include how the goals of each area affect the overall facility. Identify members of the QAPI team. Include how the facility QAPI program connects to the organization's overall mission and values. Of course, documentation is a key component of each of the newly implemented F-Tags. Individual employee records should include details of each training, when it took place, a signature of the participant, identification of the instructor and their qualifications, as well as any pre/post-test documents. Assembly of a system for documentation should be established well prior to the November 2019 implementation date. Utilize the pre-November time frame to work out your training plan. Identify and correct any inconsistencies in your plan, making adjustments as necessary prior to the records being reviewed under survey. These training requirements will continue to be reviewed during survey and results of how well the education is implemented will be obtained through interviews with residents. 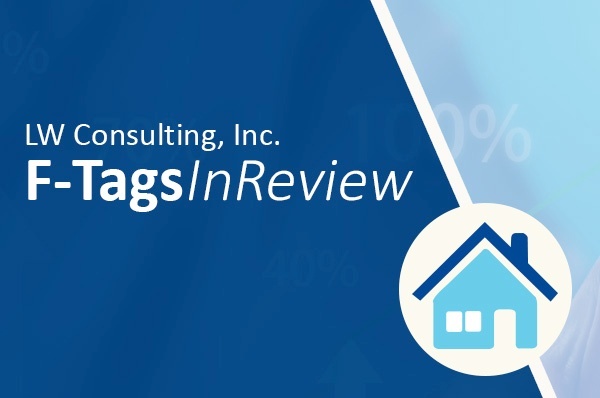 LW Consulting, Inc. will continue the F-Tags In Review series, offering insight into these new regulations throughout the year.